French Emblems: Emblem: Seipsum vincere, palmarium. To be victorious over oneself is what deserves the prize. Munit adianti se virente ramulo. Look how the crested hoopoe, sick from a surfeit of grapes from the vine, Strengthens itself with a flourishing branch of maiden-hair. The mind of Wisdom, enslaved to the appetites, arms itself with good counsel: And abstinence breaks the power of alcohol. gine & immersabilis poenitudinis ramulo. A heroic hexameter with an iambic trimeter. The hoopoe is a crested bird, with feathers sticking up on its head like a flexible crest; the French call ‘un hupe’. 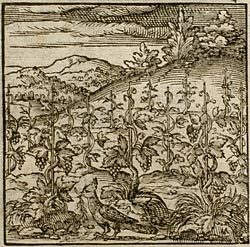 Horus [Horapollo] writes that when this bird feels that it has become sick from a surfeit of grapes, of which it has an inordinate fondness, it plucks the herb adianton which herbalists call ‘hair of Venus’, to make itself better, and goes round grasping a twig of this herb in its beak. Those whose health has been damaged and ruined by alcoholic over-indulgence, should detoxify themselves with the [adianton] twig of abstinence. Those who are in thrall to those unruly despots, our passions, or (as Plato put it) the whips and chains that drag us hither and thither in different directions - they should seek their remedy in the principles of religion and Holy Scripture, and should fortify their mind, which should rule over those turbulent passions as it were like a sort of queen. Which is the first and foremost victory: to be master of yourself. Those who desire to expunge their wrongdoings properly [or according to due religious ritual], should cleanse themselves by washing in tears, and with the twig of unquenchable penitence. 1. Arnoldus Sasbotus is so far unidentified. 2. Horapollo (Orus Apollo): Egyptian grammarian, wrote on hieroglyphics, 5th century AD. 3. Greek ἀδίαντος (maiden’s hair).